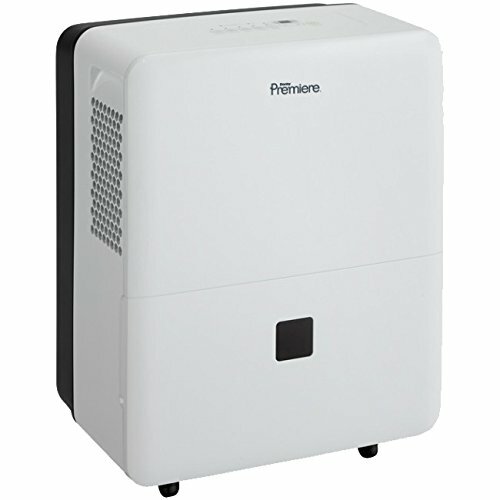 Dehumidifiers are used for different purposes and in different rooms. With so many brands and models on the market, it can be confusing to choose the right dehumidifier. Danby premiere dehumidifiers are a popular brand, and there are different models available depending on the size of the room you need to use the dehumidifier in. To help you make the right choice, I’ve compiled a review of Danby dehumidifiers. Luckily I’ve done the hard work and research for you! Here is Home Health Living’s Danby premier dehumidifier reviews- all the Danby dehumidifiers review in one easy-to-read post. Dampness doesn’t just occur in smaller rooms- large rooms are also susceptible to mold and mildew growth. That’s why it’s important to know the size of the area you need to dehumidify. For a large room or space, the Danby DDR70B3WP dehumidifier, also known as a Danby 70-pint dehumidifier, is the best option for you. The dehumidifier can hold up to 70 pints per 24 hours. For those from other parts of the world, 70 pints is the equivalent to around 33.1 litres. This makes the dehumidifier work best in an area of up to 4500 square feet. There is a direct drain feature so that the dehumidifier can automatically empty the water and you can have continuous use. 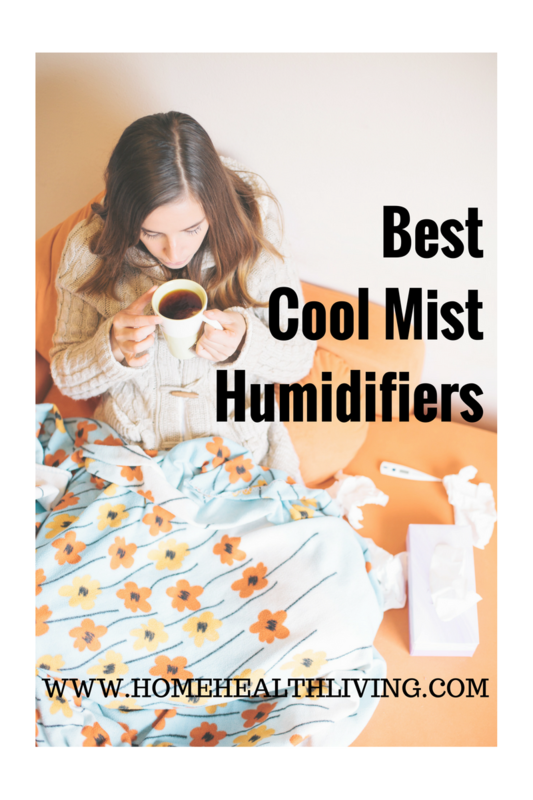 This is handy if you are using the dehumidifier in a space that you don’t often visit, such as a basement or crawl space. And while the Danby 70-pint holds a lot of moisture, it has an Energy Star rating and uses an environmentally-friendly R410a refrigerant. Not only will this dehumidifier be kind to your energy bills, it is also safe for the environment. You can also control the dehumidifier’s fan speed with two settings available: high and low. Control is via the electronic digital panel. Just like on the coils of a refrigerator, ice can build up on a dehumidifier’s coils. To prevent this problem, Danby has included a de-icing feature to ensure that the coils remain ice-free. The dehumidifier has a low-temperature feature which means that you can use it in areas where the temperature is as low as 41F (or 5C). The Danby 70-pint dehumidifier is portable, so it can be moved around quite easily thanks to its castor wheels. It comes with a removable filter that is very easy to clean, and has auto-restart feature. If you don’t need a dehumidifier quite as large as the Danby 70-pint, then the Danby DDR60A3GP, also known as the Danby 60 pint dehumidifier, might be a better option. It is generally ideal for dehumidifying areas of up to 4000 square feet and has a moisture capacity of 60 pints, which is equivalent to around 28.4 litres per 24 hours. 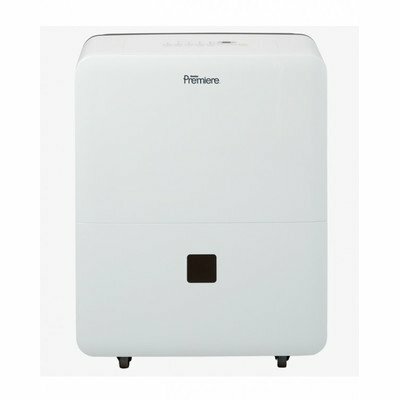 The dehumidifier has a simple and clean design, so even though it is an electrical appliance, it has a more minimalist appearance than other dehumidifiers on the market. You have the option of two fan speeds, high and low, which can be controlled using the digital control panel. And rest assured, the Danby 60 pint dehumidifier is energy efficient and compliant, and uses the R410a refrigerant which is safe for the environment. There is also an auto-restart feature which is great because it allows the unit to operate continuously until the temperature reaches 41F (or 5C). If you are using the Danby 60 pint dehumidifier in more than one room or space, you will find it easy to move the unit around because it is set on castor wheels. The unit is also easy to maintain and clean- the filter is removable and can be cleaned and reused. The Danby 60-pint dehumidifier has a de-icing feature that prevents ice build-up on the coils, much like with a refrigerator in your kitchen. Danby also offers a 24-month warranty on parts and labor. There’s nothing more uncomfortable than spending time in a room that is humid! Which is why using a dehumidifier is a great solution for those who spend time in places where the moisture level in the air is quite high. The Danby DDR50B3WP, also known as the Danby 50-pint dehumidifier, is a sleek and stylish-looking dehumidifier that performs well in rooms up to 3000 square foot. It has a 50-pint capacity which is equivalent to around 23.7 litres per 24 hours. It can be used continuously, and there is an auto-restart feature that allows the unit to keep running until it reaches the lowest temperature allowed (41F or 5C). 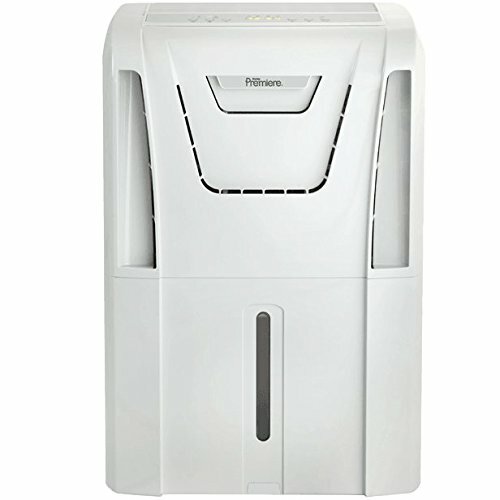 If you need to continuously use a dehumidifier but you are worried about the impact on the environment and on your wallet, you’ll be happy to know that the Danby 50-pint dehumidifier is energy efficient- it has been energy star rated and uses the environmentally-friendly R410a refrigerant. Compared with other brands of dehumidifiers, the Danby 50-pint will actually save you money. The unit has a quiet operation, making it a great option if you need a dehumidifier in a large living space but don’t want the noise of a loud dehumidifier. You have control over the dehumidifier’s fan speeds, which can be set at either high or low. You can also adjust the humidity settings. This is controlled via the digital control panel. 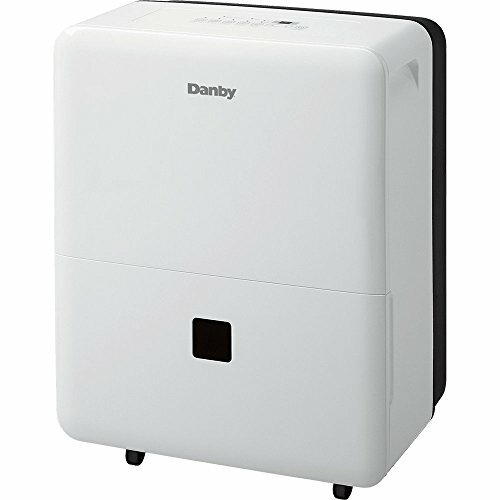 The Danby 50-pint dehumidifier has a removable air filter that is easy to clean and reuse. And if you are concerned about how much cleaning is involved, you’ll be glad to know that the de-icing feature means that there won’t be a build-up of ice on the dehumidifier’s coils. Moving the dehumidifier around or from room to room is also easy thanks to the easy-roll castor wheels. Danby offers a 24-month warranty on parts and labor. Don’t need a large dehumidifier? The Danby DDR30B3WP, also known as the Danby 30-pint dehumidifier is a great option if you need to dehumidify a space of up to 1500 square feet. This makes it a perfect choice for families wanting to keep the moisture levels in their living room at a perfect level. Who wants to feel sweaty and uncomfortable in a humid room? The Danby 30-pint dehumidifier has a capacity of 30 pints which is equivalent to around 14.2 litres per 24 hours. It features a direct-drain system so that the unit can automatically drain itself without you having to go and check on it. Thanks to its auto-restart function, the Danby 30-pint dehumidifier can be used continuously until it drops to a certain temperature (41F or 5C). The unit is energy star compliant and uses an environmentally-friendly refrigerant- the R410a. This not only saves you money on your energy bills, but you also don’t need to worry whether your dehumidifier is contributing to environmental issues. Thankfully, it isn’t! You can also control the fan speed of the Danby 30-pint dehumidifier by using the high and low settings on the digital control panel. The simplistically designed Danby dehumidifier has castor wheels which is handy if you need to move the dehumidifier from one room to another, or to a different position in your room. Cleaning is also a breeze- simply remove the filter and clean and reuse. The automatic de-icing system prevents ice build-up, which is one less thing you need to clean or worry about. The Danby 30-pint dehumidifier is covered by a 24-month warranty on parts and labor, and there is a carry-in service available. If you’ve decided to purchase a Danby premiere dehumidifier, the best way to narrow down the model choices is by knowing the size of the room that you need to dehumidify, and the budget that you have available. The main differences between the various Danby dehumidifier models is the moisture capacity, which determines which size room the dehumidifier is best suited to. The cost of the dehumidifier also varies depending on the size. Once you know your budget and room size, you will be able to choose the right Danby dehumidifier for your needs. Disclaimer: This post contains affiliate links. If you make a purchase via these links, we may be paid a small commission at no extra cost to you. The commission we receive helps us cover the costs of running Home Health Living. Thank you for supporting our family!